Charming three-quarter length folk portrait in watercolor and pencil on paper. This young girl wears her hair parted in the center with two plaited braids from her temples. The braids are then looped back so that they hang to the middle of her ears. They are tied in place with black ribbon. I can't tell whether her hair in the back is plaited or ringlets but I suspect they are braids treated much the same as the front braids. She wears a beaded necklace that could be pink coral or pinkish pearls. Her dress has a low rounded neckline with dropped shoulders that are pleated and then launch into huge stuffed puffy sleeves and then tight cuffs. The sleeves are basically the gigot type with the exception of the pleated shoulder which harkens back to the "bishop" style. The young girl holds a red flower (possibly a rose) and a basket of flowers sits behind her and to her proper right. 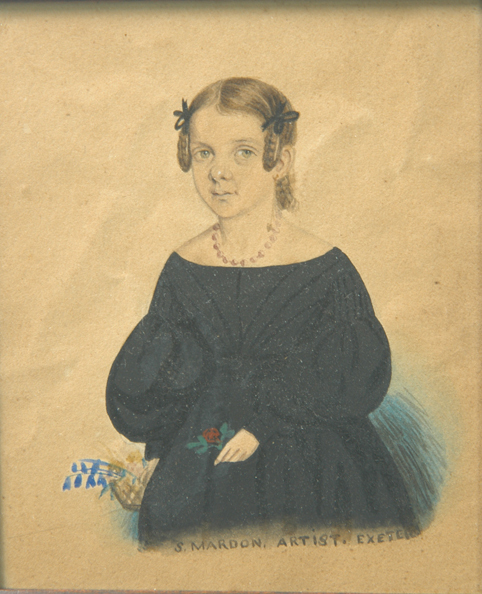 The style of both her hair and dress indicate that the painting is circa 1830s. It is signed directly below the figure "S. MARDON, ARTIST. EXETER". The American Exeter is in New Hampshire and this portrait does have a real American flair, but there is also an English Exeter. 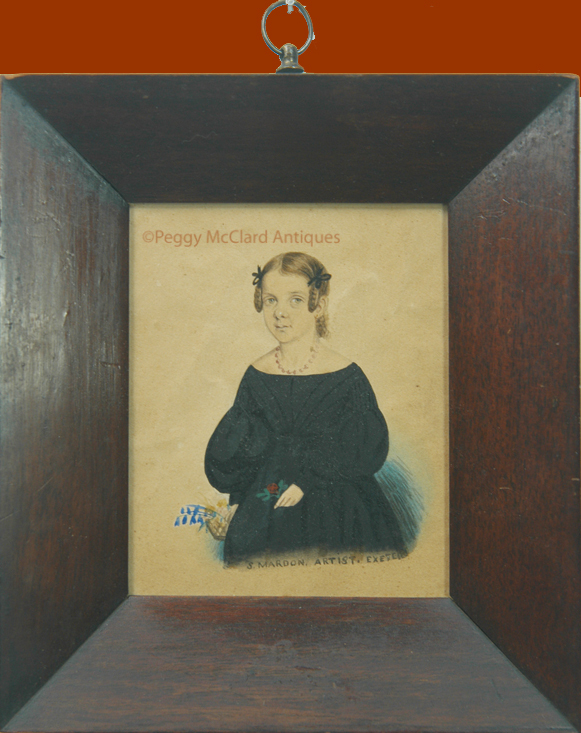 The period wood frame is 6 1/4" x 5 5/8". As you can see, there is some slight crinkling and toning to the paper. I've not found anything about the artist S. Mardon although I have found that Eldred's Auction sold a three quarter length watercolor man in 2008 and artnet.com lists that a portrait of a Sea Captain was sold. However, there is no date or auction house listed. An excellent little folk portrait with lots of charm. New information about S. Mardon has come to light from a reader who is researching portraits done by S. Mardon of his great-grandparents who lived in Penzance, Cornwall, England. It looks like this lovely portrait was painted by an English artist from England. Many thanks to the gentleman who emailed me with this information. This is how scholarship develops!